Google Chrome does an okayish job of saving your logins on various sites, but dedicated password management apps are way better. 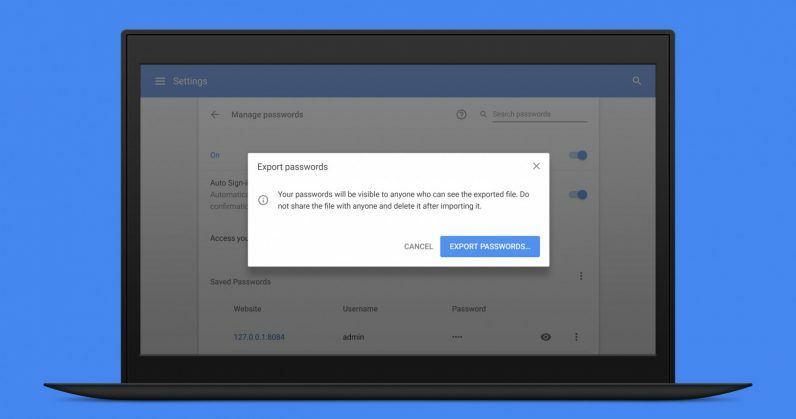 If you’ve been meaning to switch, you’ll be glad to know that a recent update to the browser now lets you export your passwords so you can import them into a different app easily. You’ll want to make sure you’ve got Chrome v64 or newer for this to work. Simply paste chrome://flags/#password-export into the address bar, and set the Password export feature to ‘Enabled,’ and relaunch the browser. Next, head to Settings > Passwords and forms > Manage passwords, and find the overflow menu alongside Saved passwords – it’s the button with three dots. Click it and then choose ‘Export,’ and you’ll get a .csv file containing all your login credentials. You can then import that file into password managers like Lastpass or 1Password. I use the former because it’s free for a single user across multiple devices, and works on most mobile apps, in addition to browsers. Paid plans for such apps let you share your logins securely with friends and family, and can also alert you if your credentials have been leaked in a security breach. Plus, they can automatically generate and store passwords for new accounts that you create, negating the need to memorize odd strings of characters, or falling back into the unsafe habit of using the same password across several services. That’s how you get hacked.